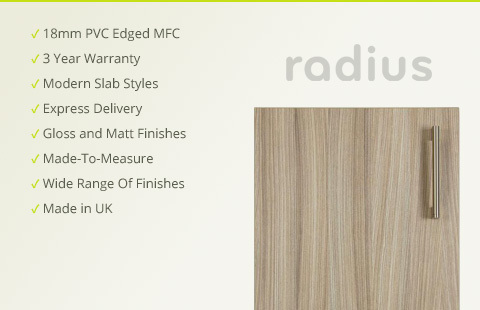 These Premium PVC edged bedroom unit doors are made from high-density MFC and edged using a pre-milling edge bander which gives a better finish and applies a matching 2mm PVC edge to all sides. This range of replacement bedroom doors comes in a variety of finishes including solid colours, laminate wardrobe doors and new modern or traditional wood grains. In addition to this, doors are also available in high gloss and gloss panel. You can choose from vertical or horizontal grain directions to suit your style and taste. Once you have chosen the perfect bedroom door for you, have a browse through our cabinet handle ranges to choose your perfect handles to complement your new bedroom doors and drawer fronts. Otherwise, browse our complete range of bedroom doors. Remember, if you need to cover the sides of your old units, just order as made to measure doors and fix to your old bedroom cupboards or wardrobes to cover and create a brand new fresh look.